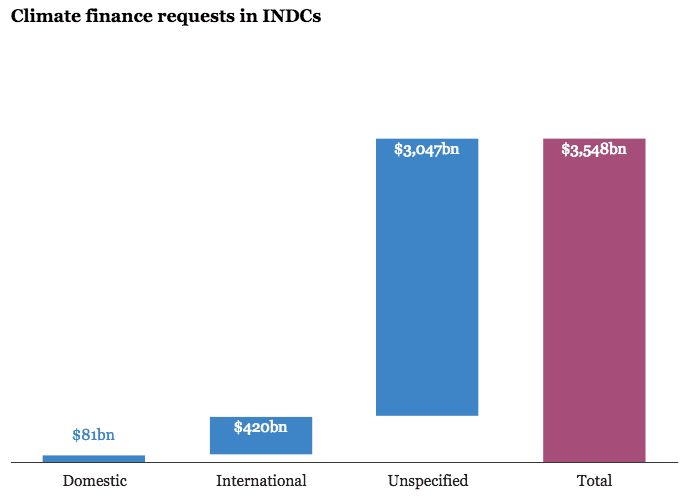 Carbon Brief published an analysis in which it summed how much money developing countries need to respect their “intended nationally determined contributions” or INDCs as submitted and accepted part of the COP21 UN summit, which just finished last week. The report estimates the 73 developing and least developed nations require at least $3.5tn to build a new energy infrastructure to reduce emissions — and that’s only up to 2030. What’s more, this estimates is only a fraction of the real cost since not all nations were specific about the investments required to meet their stated goals. There’s a great deal of investment that can be offset by private entities and carbon markets, yet there’s still a lot of money that needs to be invested, and this money needs to come from international aid otherwise countries like those in Sub-Sahara Africa or much of Asia could not possibly balance the two major responsibilities these now face: 1) cater to the needs of their people (India has 300 million people who live ‘in the dark’ with no electricity); 2) peak or reduce emissions to help the world achieve a global goal of no more than 1.5 degrees Celsius past industrial levels, as agreed by over 190 countries in Paris. it’s worth mentioning that the INDCs each country submitted prior to joining Paris limit global warming to 3 degrees Celsius, not 1.5. This means at least doubling efforts and investment to meet stay in the 1.5 range. The terms of the agreement are valid from 2020, which gives developed and developing nations five years time to find the required funding.